Students and their relatives attended an exhibition of music, dance and vocals—preceded by homemade food—at the Maryland Hillel Marilyn Allswang Eisenberg (z’l) Arts Showcase Saturday night. Inside this university’s Memorial Chapel, during Hillel family weekend, parents and students gathered to celebrate the arts as a community. The three Hillel a cappella groups—Mezumenet, Kol Sasson and Rak Shalom—and the Hillel Israeli dance troupe, Avirah, performed during this showcase. The exhibition began with an introduction from Danya Allswang, the granddaughter of the woman after whom the show was named. “This showcase tonight bridges the arts and the Jewish community,” Allswang said to the audience. Kol Sasson started the entertainment with three songs for a crowd of around 200 people. Following were Mezumenet, Rak Shalom and then Avirah. In between each performance, student MCs made humorous rapport with the audience and introduced each group. Rak Shalom performs a song at the Memorial Chapel for the Hillel Arts Showcase. Haleigh Whisted/Mitzpeh. After rehearsing for the showcase since September and for 10 hours the week of, Mezumenet, an all-female group, decided to sing one English song, one Hebrew song and one parody song, specifically for this audience. The a cappella group likes to display the wide range of music they sing for the parents and students during the annual event, according to Mezumenet President Jocelyn Broth. Mezumenet performed their original song “Challah Back Girl,” which is their parody of Gwen Stefani’s, “Hollaback Girl.” The all-girl group sang about their “love” of the traditional Jewish bread. Ron Reisler, a visiting parent, enjoys coming every year to see the show and watching the performers “wax and wane” over time. Reisler has attended this event for the past five years. “We often receive criticism for performing songs that aren’t so well known, so we are attempting to bridge that gap this year,” said Rak Shalom President Ariella Shapiro. “We have felt the weight of thousands of years of history,” said a representative of Rak Shalom to the audience right before their mashup. One song in the remix is about the destruction of fire while the other is about the destruction of Jerusalem, according to the representative. 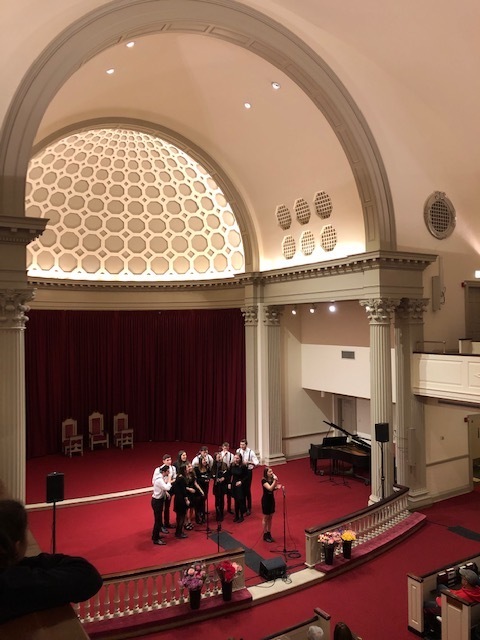 “It is amazing how the a cappella groups can sing mixes of Hebrew songs and English pop songs; it really shows their vocal versatility,” said Carli Fine, a junior psychology major. A quick beatboxing competition between three students, each from one of the a cappella groups, took place right before Avirah performed. Avirah presented a traditional-style Israeli dance, Lakum, choreographed by their artistic director Hannah Weisman and co-President Adina Schwartz. After the show, the audience ate handmade sushi and pizza at the Hillel Center, which they had pre-ordered on the organization’s website. A College Park local, Dave Sloan, who has a child applying to the university this year, finds it very exciting to see the creativity of Maryland Hillel on display every year, especially the Israeli selections. Rachel Spronz, Kol Sasson’s President, hopes that the audience got the same joy watching their performance that she gets out of performing it. No Replies to "Jewish tradition and the arts blend for Hillel showcase"